Brazil's President Jair Bolsonaro arrives at the inauguration ceremony of the new president of the Parliamentary Front of Agriculture (FPA), at the Clube Naval, in Brasilia, Jan. 19, 2019. Brazil's lower chamber handed right-wing President Jair Bolsonaro his first defeat in Congress on Tuesday, the day before his government presents its most important legislative proposal to rein in a gaping budget deficit and spur growth. The house voted overwhelmingly to suspend an executive order by the Bolsonaro government that altered Brazil's freedom of information law to broaden the number of officials allowed to designate data and documents as secret or ultra-secret. Lawmakers voted 367 to 57 to fast-track a bill overturning the secrecy measure and government whips were unable to muster votes to avoid defeat. The bill must still be voted on by the Senate, but the reversal showed that Bolsonaro, who took office on Jan. 1, has not yet been able to organize a coalition in Congress to back his legislative agenda. On Wednesday, Bolsonaro will send to Congress his plan to overhaul Brazil's generous and costly pension system that eats up more than half of federal spending and is the main factor behind an unsustainable budget deficit. Approval of pension reform is vital for the recovery of investor confidence in Latin America's largest economy. The defeat on the floor of the house came one day after Bolsonaro fired a senior minister amid a scandal involving campaign financing for some of his party's congressional candidates in the October elections. FILE - Gustavo Bebianno in Sao Paulo, Brazil, Sept. 29, 2018. 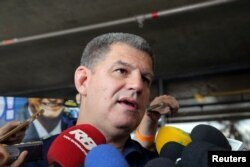 The ousted minister, Gustavo Bebianno, was instrumental in getting Bolsonaro elected but had a run-in with one of the president's sons, triggering the weeks-old government's first cabinet crisis. In a note to clients, analysts at Eurasia Group said the scandal indicated the administration's political team was in disarray, but they still expected the pension reform to get passed, albeit in a less ambitious version.